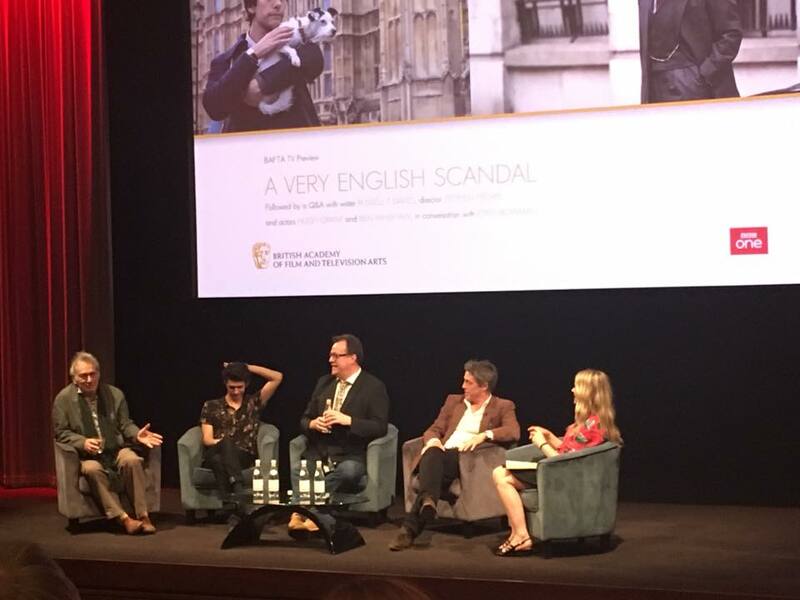 ‘Join the Liberals and widen your circle,’ jokes Hugh Grant to many laughs during this star-studded Q&A after a world premiere screening of the first of three episodes of A Very English Scandal which is to air on BBC1 next month. Grant is remembering how his school chums referred to the Jeremy Thorpe affair which saw the former leader of the Liberal Party tried and cleared at the Old Bailey in 1979 on charges of conspiracy and incitement to murder former lover Norman Scott. A Very English Scandal is written by Russell T Davies (Queer As Folk, Doctor Who, Cucumber) and based on the John Preston novel of the same name which was published in 2016, two years after Thorpe’s death. Grant (Paddington 2, Florence Foster Jenkins) plays Thorpe and the revelation from the Q&A is just how funny and self-deprecating he is in real life. Davies explains why he was drawn to Preston’s book: ‘It’s funny and dark. But also the story of a middle-aged man who falls in love with a younger attractive guy who takes too much drink and drugs. That’s a Friday night! Frears (My Beautiful Laundrette, Prick Up Your Ears and The Queen) went to school with both the late Peter Cook and Sir Ian McKellen. He thinks McKellen turned down the judge part in this because of the definitive biased judge Cook is renowned for. Davies described Norman as the ‘great survivor’ and says the series has his blessing. ‘He’s seen it and loved and was moved by it. We saw the 1st episode and can’t wait to see the final 2. It’s a story that’s difficult to believe could ever happen today although, as Davies points out, as work on the project was underway politician Keith Vaz was making headlines. Regular readers of this site will know what fans of both Whishaw and Davies we are but the revelation here is Grant, who we loved in Florence Foster Jenkins, but here utterly convinces as the vain politician who thinks the very establishment that frowns upon his homosexuality will ultimately protect him. Entwined with this story is that of badger-loving Arthur ‘Boofy’ Gore, the 8th Earl of Arran, who helped decriminalise homosexuality in 1967 and why he did so. Fans of Davies’ enthusiasm for his trademark cocktail of emotional, bitter and comic will find much to revel in here.